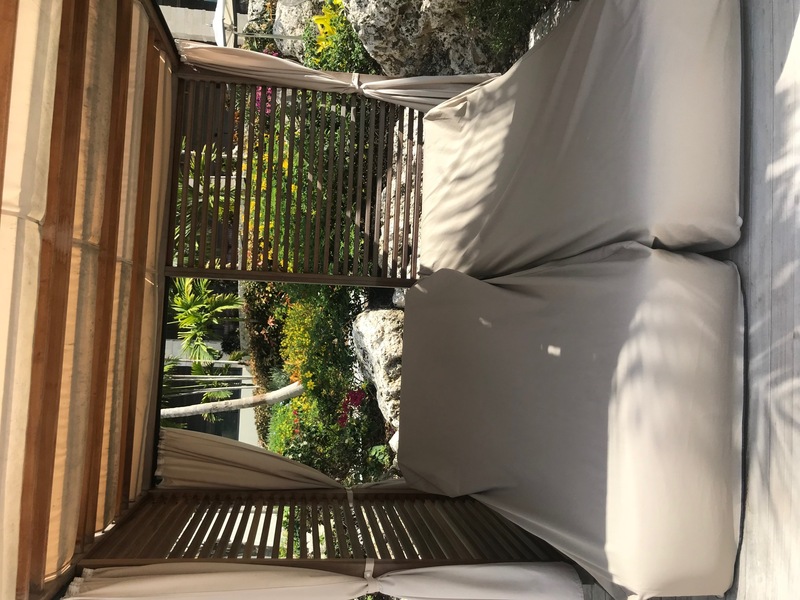 IHG’s Kimpton Seafire Resort and Spa Grand Cayman Review. Is it Truly 5 Stars? Kimpton Seafire is one of the newer resorts in Grand Cayman and one of a select few with a 5 star rating. The resort houses 266 guestrooms and suites all with their own private balcony. This is one of just a handful of Kimptons located outside the United States. The outdoor areas of the Seafire are stunning and the prices are reasonable compared to the Ritz down the block. My Cost: I got very lucky that I still had a Free Night Certificate redeemable for any hotel within the IHG portfolio (unlike the new ones which are capped.) The cash rate for the Sunday night I stayed here was over $1100! I sure got my money’s worth on this redemption when you factor in the upgrade I received for being a card member. Chase and IHG have walked back the changes on the IHG card a bit, you can read the details here. For 80k points and a free night, click here to learn more. Cash Rate: Prices seem to start around $475/night and go all the way up to $1200. The Seafire is located on the iconic Seven Mile beach about a 15 minute drive from the airport. The Seven Mile beach area is not all that big so the resort was fairly close to some popular restaurants and the other beach resorts. The check in process as well as the arrival really help set the Seafire apart from other resorts. I’m not sure it was 20 seconds before I had a glass of Rose in my hand. We were greeted by multiple people with big smiles who profusely thanked me for being a loyal IHG member (I’m not, I just have the card.) We got there extremely early around 11 AM and not only were they trying to find a room for us they were trying to find an upgrade. After a few minutes, the manager came over and said they would be able to upgrade us to a larger oceanfront room which was great because as you can see from the picture the view was incredible. I checked the website and it looks like the oceanfront rooms go for about 200-300 more a night so this is definitely an upgrade I was thankful for. I thought the room was very nice. I prefer a more classic look but that’s certainly not the Kimpton vibe. Kimpton is generally known for being fresh, young and colorful and this resort is no exception. It was spacious and thoughtfully laid out. For reference this is an accessible room, otherwise there would have been a soaking tub. I cannot say enough about the service at the Kimpton Seafire, it was phenomenal. From the groundskeepers, to the bartenders to the front desk staff, everyone was incredibly friendly and eager to be of assistance. When we got to our room there was a charcuterie board with meat, cheese and fruits as well as 2 large bottles of San Pellegrino, with a card that said “Welcome home.” What a nice touch! Kimpton is known for having some pretty cool amenities. A personal favorite of mine is the Forgot It, We’ve Got It Amenities. Basically, they have a ton of stuff that I so often forget while I’m travelling and will bring it to your room upon request. The mini bar here was fully loaded, which I always appreciate. This was my favorite part of the Seafire. I thought the pool and beach were absolutely beautiful. There’s also a decent bar and restaurant that sits beach front making for the perfect atmosphere to relax with a drink. Overall, Kimpton Seafire Resort and Spa is a beautiful hotel located on a beautiful beach. Since it is one of only a few five star hotels in the area, I would choose Kimpton over the Ritz Carlton because the prices were much more reasonable and the service was a cut above. IHG's Kimpton Brand Seafire Resort and Spa is one of the newest on Seven Mile Beach and the staff, service and beautiful outdoor area truly make it stand out. Previous articleNew Targeted Hyatt Promo: Save 20% Off Hotels in Random Cities! Next articleNOW LIVE & UNLIMITED(?) Fee Free Points Earning Visa GC Deal – 5X Ultimate Rewards! I also used my annual cert here as it was an unbelievable value . As you stated with GCM the taxes are so high that the price of hotel skyrockets if someone was to pay for it . Staying at the Marriot for 1 night the water was calmer and clearer there. But the Seafire Resort was jaw dropping. I didn’t get over to the Marriott, but I agree, beautiful resort and I’m thankful I was able to get such value out of my cert. I will be staying there with my wife in February on points for one night and free cert from cc on the other two. We’re you charged any additional fees/taxes? I made the rookie mistake of checking out without getting my bill, I will email them for a copy and let you know as soon as I get it. Wondering how it compares to the Westin Grand Cayman? I’m heading here in October with the wife & kids and debating between the two. I have never been to the Westin, but someone who’s opinion I trust said it beautiful there. Sorry I don’t have more details. Did you stay at Ritz there too? Is review coming? I would agree, send them an email and I can’t imagine they’ll have any issue tying the reservations so you don’t have to move rooms. I did also stay at the Ritz and preferred it slightly, BUT if I had to go back I would do Seafire because the prices at the Ritz were offensive and I’m not someone who cares about inflated prices. I almost felt like there was an heir of “we’re the Ritz, so deal with it.” Review is coming in the next few weeks though. Both places are beautiful- you probably can’t go wrong. wow – looks very impressive. I’m putting this on my list, thanks for sharing. Is this also close to off site restaurants? Yes, very close to Luca which is very popular as well as a sushi place that I’m blanking on the name. It’s less than a 5 minute drive to a lot of popular spots. Interesting review, but unlike your other posts, this one is very disappointing. you didn’t go far enough on questions that should be covered by any decent review in this “hacker” space. What I worry about when using IHG free nights non all-inclusive resorts is how much we’ll get soaked for “everything” else after the basic room. (the vegas/Spirit airlines model. Surely you’re aware of such obvious questions, but you ignore.)…. Seriously, what are the dining options there? How much on average for a meal pp.? $50, 100, ?? You don’t say, so guessing it’s extremely high — and thus you don’t mention. Likewise, your credibility suffers when you chirp about “appreciating” a fully loaded mini bar in room. Seriously? Those minibars are notorious for racking up outrageous room charges, per cracker. That you don’t comment at all — hurts the integrity of your post. Guessing this was a comp’d post. Most certainly not a comped post, I’ve never done one of those (I used my IHG free night and this is only the 3rd time I’ve stayed with the brand). And, I like mini-bars, they’re convenient. I don’t mind paying extra for convenience. Also, I only stayed there one night, so I didn’t get to eat which is why I didn’t comment. Do you have to pay the resort fee even if you use the Chase IHG free night? I liked your post. You’ve been there and it’s helpful!! And the picture of the minibar too. At least theres a place to store some cold ones unless it’s one of the electronically monitored ones if you move a can you get charged. We usually pull those drinks out on day 1, use the frig for our own, then put them all back on the last day! Hah that’s really smart!!!! This one was not electronic So I think that would work, although at Kimpton I’m sure they wouldn’t mind sending up a fridge for you they’re very accommodating and that way. And thank you!! Could some of the pics turn 90 degree clockwise? Made a reservation for next April. Free night plus 3 at 70,000. So also 4 at 189,000. Thanks for the review. That’s such a great rate! Enjoy!!! Just out of curiosity, why did you get the all the free stuff: charcuterie board, 2 large bottles of San Pellegrino and champagne? I’d like to say because they read the blog and wanted to impress me ;). But I have a feeling they do stuff like that for elite members, a lot of places will give a free dessert here and there, the champagne was definitely extra generous.